There's a lot to be said for a neutral interior design scheme, but sometimes, you just want to let your personality out to play. It's clear to see that this home is filled with creative, artistic people who instructed an interior designer to 'go wild with patterns'. What's astonishing is how well each space works with the next, as despite a medley of bold and brave patterns, nothing looks too much or over the top. Now that really is clever design and we are starting to think that maybe a few statement walls in our homes wouldn't go amiss! Come and take a look at this astonishingly playful home and see if you might fancy embracing some fun too! 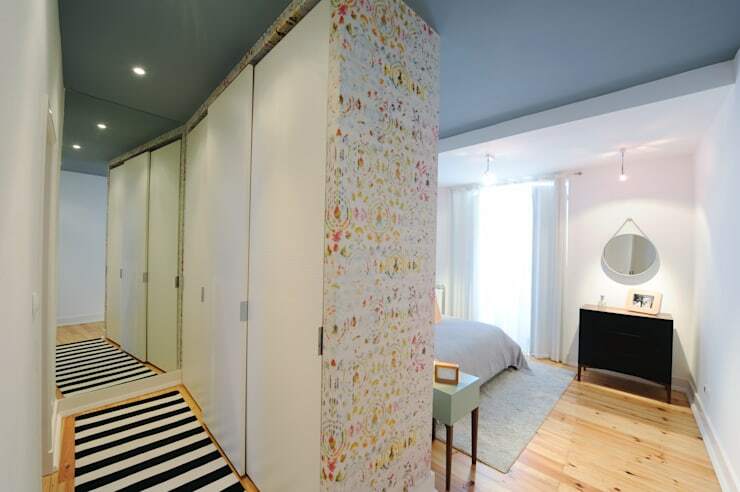 A cordoned off section of the master bedroom, this charming little dressing area has been made a whole lot more fun with some pretty floral wallpaper. It's amazing that the striped rug doesn't look at all out of place here either, but with a neutral floor and lashings of white furniture, it's just the right amount of contrast. 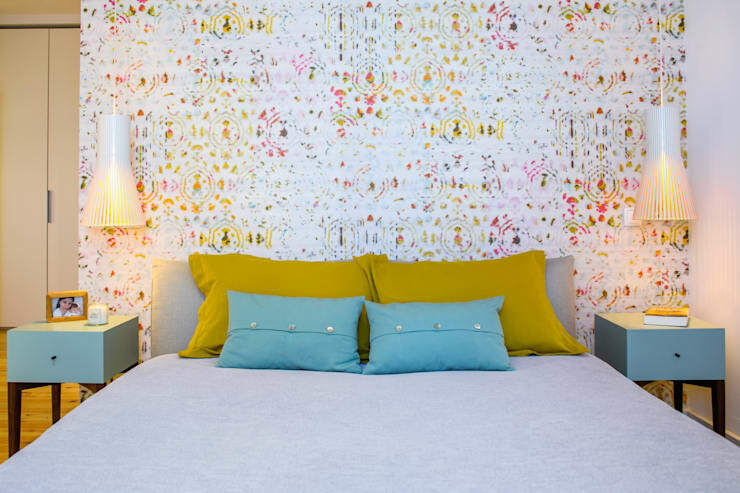 Here is where the rest of that dressing room wallpaper ended up; in the bedroom, as a beautiful feature wall and headboard alternative! You can already see that colour is a much-loved attribute of the residents here and while bright pillows should look too much with the wallpaper, they really work and pick out the gorgeous hues. Just look at this small hallway. Even though it is a tiny space, there was still room to include a fantastic houndstooth bench seat! Adding some distinctive style to even this area shows how committed the owners are to expressing themselves throughout the home. Firstly, this is a wonderful space that feels homely, well put together and cohesive, but on top of that, just take a moment to appreciate the medley of colours, patterns and that ceiling! 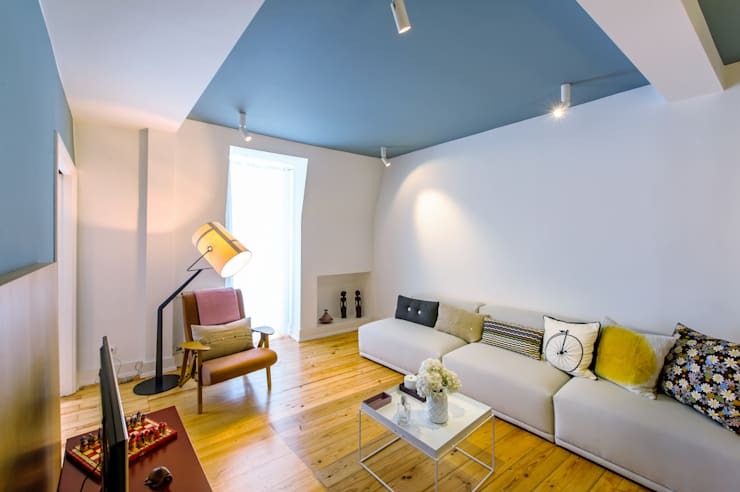 Set to be a huge trend in 2017, painted ceilings are a risk, but the sky blue here is nothing short of a triumph! There's almost a retro note coming in, via the furniture, which really is the icing on the interior design cake! A retro dining table and chairs set, statement lighting and gold flocked wallpaper. On paper, this would be a recipe for disaster, but in reality, it looks spectacular! We think the neutral wooden flooring throughout is helping to maintain balance and harmony, otherwise how could this space work? So good they used it twice! 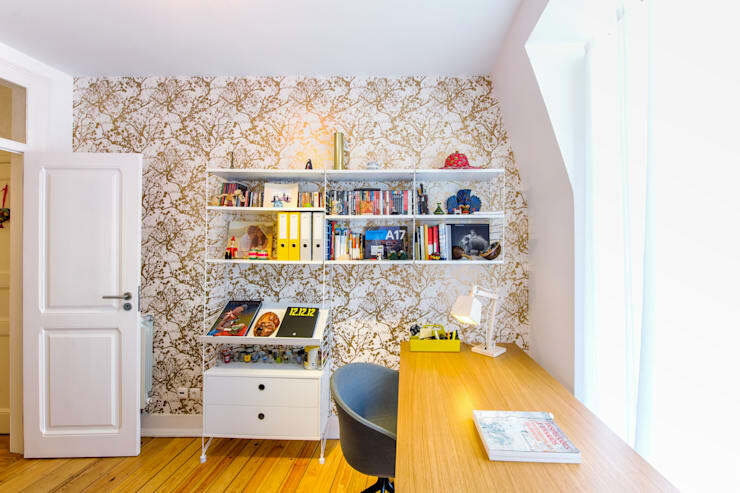 The gold flocked wallpaper in the dining room was such a hit that it was also used to create this wonderfully artistic home office space. Yet more retro furniture, this time a storage unit, has been added in to contrast with the modernity of the décor and a desk with a view is the perfect finishing touch. What a productive space! 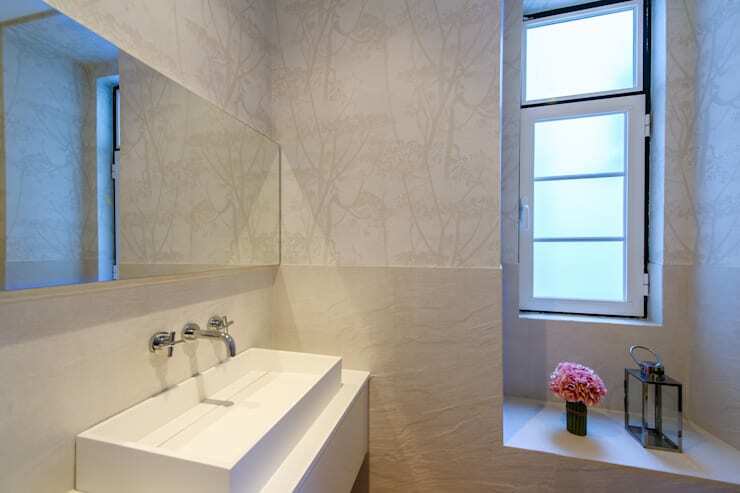 We have so much love for this audacious bathroom wall! 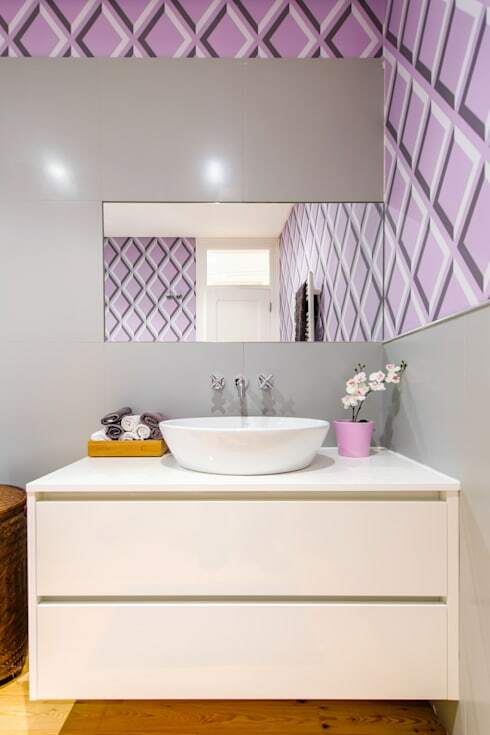 Adding in some stunning pastel hues, as well as funky geometric shapes, this diamond lattice wallpaper has us thinking about a feature wall in our shower rooms! It's interesting to see that it's been added to the top half of the walls only though. Perhaps you CAN have too much of a good thing after all and this is a fine balance? Even here, in the second bathroom, there are patterns taking centre stage, though they are more subtle than some of the others! A textured lower wall half meets beautiful neutral wallpaper effortlessly and creates a visual display that even pared back design fans will love. This house really has it all! Is this not the most adorable kitchen that you've ever seen? 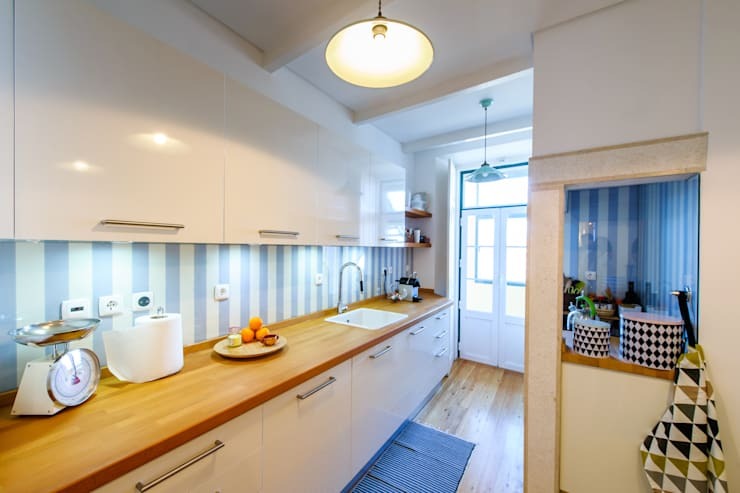 Baby blue candy-striped walls add such a sense of whimsy and fun to this space and helps to keep the cabinets looking chic and minimalist. The little blue accents everywhere are subtle enough to not overpower the room and really keep all eyes on that amazing wall! What a cacophony of incredible styles and patterns! If you really enjoyed the variety here, take a look at this Ideabook: 12 examples of incredible wallpaper. 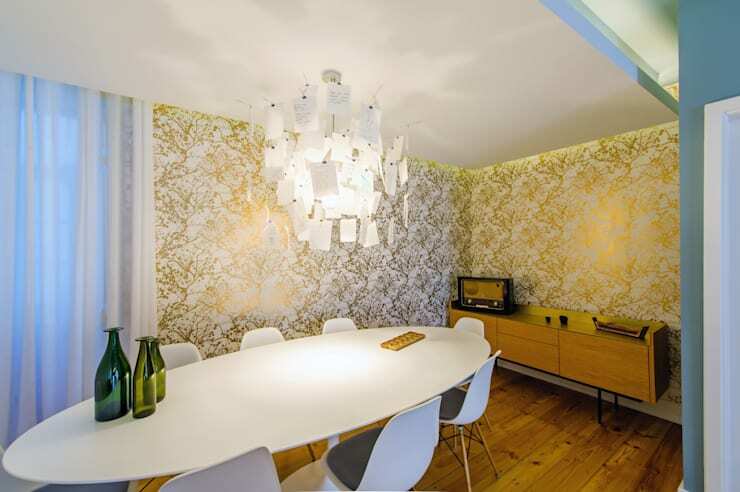 Are you keen to use statement wallpaper in your home?